Léa Donguy and Jens Denissen are walking a circle around Berlin. Their task is complicated by the fact that no two Berliners seem to agree on where, exactly, the city starts. It is an amorphous smear on the European Plain, round in only the loosest sense of the word and almost 900 square kilometers large in the official estimate. (Minus its waterways, New York City is less than 800.) Beyond this generous bureaucratic definition, there is also Berlin as conceived by its residents, whose image of the city is not always coextensive with tax code. I’ve heard arguments from locals that Berlin’s urban limits enclose, or ought to enclose, the distant royal retreat at Potsdam; the rural Wannsee lakes; even the former Nazi concentration camp at Sachsenhausen, a sobering sixty-minute train ride from Alexanderplatz. There have never been any geographic boundaries halting its expansion (as there are, for example, around its first sister city, Los Angeles), and the Wall that once enclosed the western half of the city is a quarter-century gone. Unlike Paris, whose urban expanse ends sharply, in the minds of its citizens, at the ring of the Boulevard Périphérique, Berlin is understood to spread into the distant epidermis of vegetation, industry, and suburb. Nor has it ever stayed the same shape for very long: the city has been conquered by Napoleon, redesigned by the Kaisers, bombed to bits by British and American air forces, halved by the Soviets, and reunified by its own hands. Now it is again metastasizing, this time vertically. The current joke is that Berlin has more outrigged cranes than Dubai. Léa and Jens aren’t daunted by liminal ambiguities, though—far from it. They are free with categories and their research question sounds more like one of Zeno’s paradoxes, or a Zen kōan, than it does the sort of narrow academic concern I’d come to expect from self-described urban theorists. They don’t care about peer review, they told me. They just want to know what the edge of a city looks like. We met on a muggy October morning at the Olympic Stadium S-Bahn station, a few miles from Mitte, the city center. Léa arrived on the train after mine. She disembarked with a small group of reverse commuters but I managed to identify her when she unfolded a city map the size of a car windshield. I waved to her. A clear-eyed Parisian, she spoke English with a loping accent and, after stowing the map, took two-handed sips from a steaming cup of coffee. She smiled. I sensed this was a pretty uncool line of questioning. “It’s a grenzgang,” she said: a border walk. For ten days, they had been rising early to walk a circuit over territory that is pointedly ambiguous, arguably urban. I was the only guest who’d shown up for their tenth and final leg. Soon we were joined on the platform by Jens, a distressingly handsome German and the co-founder, with Léa, of the Paris-based Le Voyage métropolitain, which they described as a walking collective. (As far as I know it’s the first organization of its kind, although I suppose you could make the argument that any tour group qualifies.) We puttered outside the station for a while, drinking espresso and taking pictures of rooftops. Léa rolled some cigarettes and Jens bashfully admitted that he’d quit just yesterday. We chatted about the previous day’s treks. They had traveled over rooftop and dale, through culverts, across highways. I admitted to being the sort of person who waits for the walk signal at empty intersections. We weren’t going to get in any trouble, were we? We began just south of the train station, where, as we turned a corner onto a residential street, a monolith arose from behind a cluster of yellowing poplars. This was the Courbusierhaus, a mid-century project of the seminal French architect. It seemed impossible that such a huge apartment complex had been hidden from view a dozen yards away, only to suddenly fill our vision like prairie sky, but the effect, Léa explained, was intentional. Le Corbusier’s Unité d’Habitation was one of the grander utopian ideas in the crowded field that was mid-century architecture. His vertical garden cities all tend to resemble each other. Each is a blocky residential tower surrounded—smothered, really—by acres of greenery. The idea, formed out of the filthy conurbations of the early twentieth century, was to bring fresh air and sunlight to those middle-class workers who most needed it. The domino-style buildings would provide both shelter and idyllic leisure space for residents, and they would also contain broad internal avenues to be filled with shops, kindergartens, doctors’ offices, and post offices. Not for nothing is the Berlin building sometimes referred to as die Wohnmachine: the Living-Machine. Painted balconies popped like semaphore flags against the béton-brut concrete as we walked around its base. The entire structure seemed to totter on spindly legs. This was Le Corbusier showing how he would lift man out of the dirt, Jens told me. The Courbusierhaus owed its existence to Germany’s second International Building Exhibition, which in 1953 had hoped to propel the phoenix of postwar Berlin into a bright urban future. Walter Gropius and Oscar Niemeyer were among the other luminaries who contributed projects, but only Le Courbusier’s was so large it needed to be placed beyond Charlottenburg, near the Olympic Reichssportfeld. The building’s distance from Mitte seemed appropriate, considering how its conceiver had wanted to hide his cities in gardens of his own design. But no shops had ever opened in the Wohnmachine’s internal arteries. Instead, the place conveyed a sense of having been abandoned by history. Beneath the raised bulk of the tower’s north end was a covered parking lot where hornets’ nests filled each crease in the ceiling. “A good start to the day,” Jens said, taking pictures. “We could cross over them,” Jens mused to himself, tugging at a flimsy wire fence. “Let’s just go back,” Léa said. Jens nodded. Even if an ideal corneal route around Berlin were obvious—it isn’t—an additional complication has challenged Léa and Jens on their daily walks. Modern cities are not meant to be circumnavigable by foot. Their path, charted out on Google Earth, has been confounded on non-Google earth by highways, canals, hospitals, squatters’ camps, industrial parks, and garbage dumps—late capitalism’s myriad updates to the medieval city wall, constructed out of market indifference rather than fear. They have kept to their itinerary whenever possible, Léa told me, although this has sometimes resulted in routes of hazy legality. We looped around the station, arriving at the art deco stadium by way of Courbertineplatz — the second visionary complex of the day, this one a bit darker in mood. Sphinxes with excellent delts stood guard as we approached the arena grounds. “Fascist,” Jens muttered, pointing to the street sign that commemorated the founder of the International Olympic Committee. Everyone knows Hitler commissioned the stadium for the 1936 games, although in fact this is only half-true. The I.O.C. had already delivered the games to Berlin before the Nazis came to power, and the stadium itself was designed around 1933 by the architect Werner March. In one of those amusing incidents of historical patricide, Werner’s stadium was intended to replace the one his father, Otto March, had built on the same site for the 1916 games, which had been cancelled on account of that pesky inconvenience, the First World War. Scholars argue over the degree to which Werner’s designs were influenced by Hitler, and by his unhinged plans to transform Berlin into a neoclassical kingdom on steroids called Germania. (The superhuman stone athletes that surrounded us are among the few surviving examples of this prewar impulse of the Third Reich.) In the final, desperate days of Nazi rule, accused deserters were taken to the stadium to be shot. The Soviets captured it in April 1945 after a battle that left thousands of dead teenage boys strewn about the field. Today, it is home to Hertha Berlin, a middling first division football club. The wide agora before the stadium proper was starting to fill up with morning tour groups, the only official way to enter the grounds on gameless days. I caught Jens scanning the perimeter fence but he did not suggest we dig or climb our way inside the former Nazi compound like characters in a Steve McQueen movie. We just stood and gaped at the imperial entryway. Beneath the lofted iron Olympic rings, a father took a picture of two young boys who delivered stiff and discomforting military salutes. “Hm,” Léa said. We moved on. The peripheral spaces of urban sprawl are common enough in modern Europe to warrant a special term: Zwischenstadt, or in-between city. 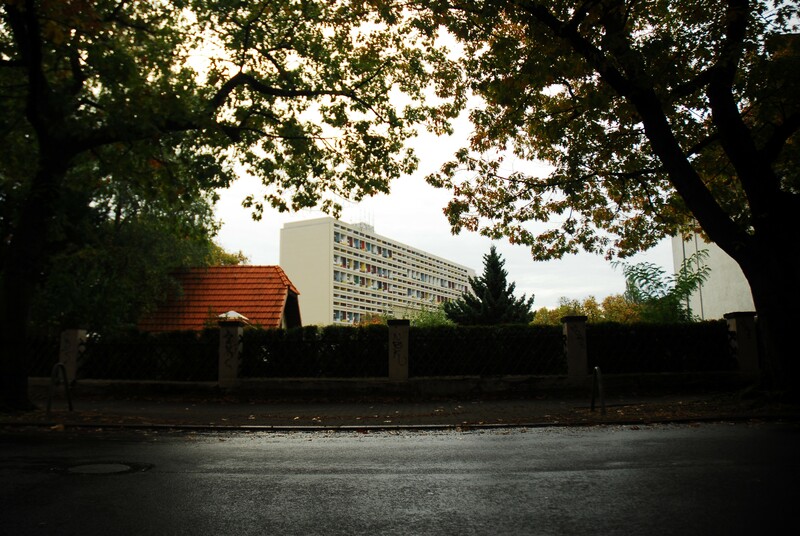 They are by definition diverse but atypically so around Berlin, a city that has seen more than the usual share of ruin and revision. 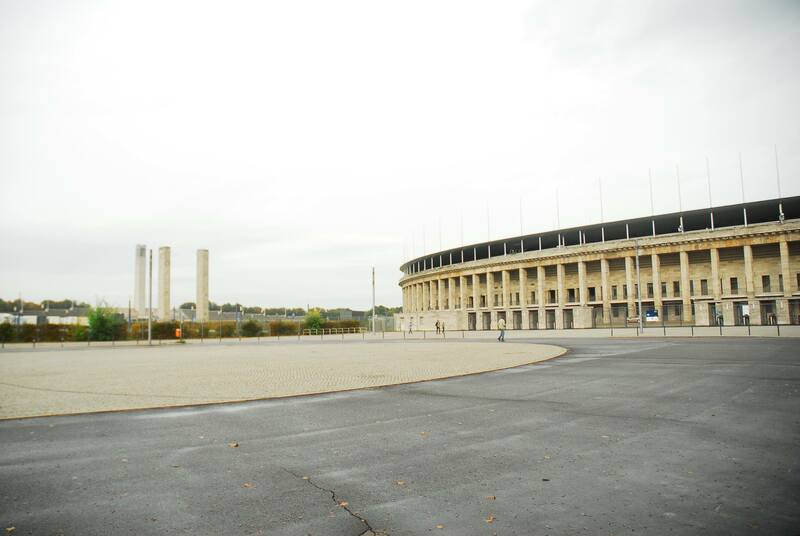 In Ghosts of Berlin, Brian Ladd remarks upon the problems city leaders have faced when it comes to “difficult” structures like the stadium, many of which lie out in these roomy zwischenstadt zones, in no danger of imminent demolition. Ladd writes that “the sports complex—like the entire Third Reich—formed an integral part of the city and of its history, a troubling legacy that could be wiped away by neither use nor disuse.” Instead, a kind of structural recycling has developed here. No longer on the world stage, yet still a world city, post-reunification Berlin has become known for its creative uses of politically charged or just empty spaces. Berghain, the power-plant-turned-techno-palace, is the most famous example of this tendency. 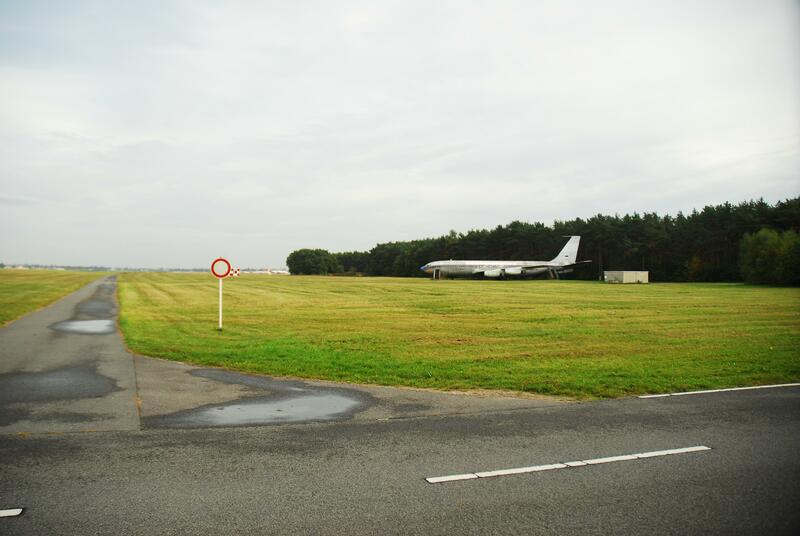 There’s also Templehof airfield, another Nazi-era showpiece and former U.S. Air Force base, today a bucolic plain for rollerbladers, kite enthusiasts, and magpies—plus a few thousand refugees from Syria, Afghanistan, and Iraq. Then there are the city’s gallery churches, its tourist bunkers, its glass-domed Reichstag. Berlin has always known how to work its old symbols. It was the reputation that drew Léa and Jens here for their project. “We’ve done suburban walks in a lot of other cities,” Jens said. “But it’s always a new experience. We’ve never walked all the way around one before.” What they really loved, he explained, was sharing the sorites paradox of peripheral urban spaces with the people who lived in them, a central goal of their collective. “Often people don’t even know their own neighborhoods,” Léa said, eying me—a new transplant, fresh from the cornfields of Iowa. I looked around with what I hoped was visible enthusiasm. From the Olympic stadium, it was a short walk to an aluminum-lined U-Bahn yard where several of the familiar yellow cars floated on iron hoists, awaiting repair. 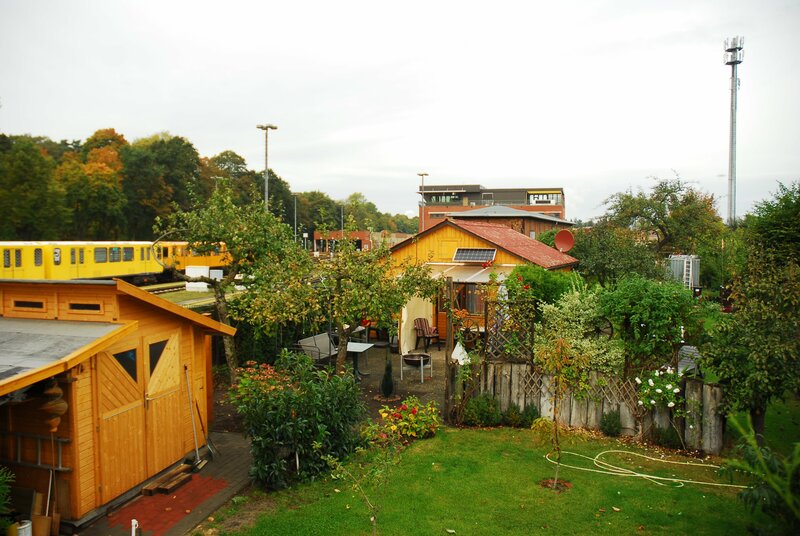 The yard was surrounded on all sides by Schrebergärten, community vegetable gardens and kitschy cottages no bigger than tool sheds. Everything was mixed together in the urban fringe. Soon we found ourselves walking along the shore of a placid, muddy lake, and a few moments later we were standing on the side of a noisy frontage road, where we nodded to three men sitting at a picnic table that seemed to have been lobbed into a ditch. The men were drinking beer in a way that suggested tremendous sense of purpose. They did not register our presence. Past this crew, we reached our first real impasse. A sunken four-lane highway, industrial park, and the river Spree lay between us and the path that Léa and Jens hoped to follow. Directly before us, a tall, private railway bridge stretched partway across this no man’s land. Otherwise it was impassable for three kilometers on either side. I averted my gaze, instead looked up at the deep blue of the industrial rail bridge, which was plainly not meant for human passage, and seemed even purposely hostile to all forms of life. I knew that any objection at this stage would violate the spirit of our walkabout—exploring the frontiers of vegetation, residence, industry—a spirit beholden to no law except that of the line. It knoweth not the verb to trespass. Besides, I felt a little obligated to reaffirm the legitimacy of their work, which, as they’d explained just minutes ago, required the presence of a local witness. I was also conscious of looking like a sissy. So I signaled my assent and kept silent as we picked our way along a fence until it ended at a concrete pylon, and again said nothing as we stomped through brambles and thorny scrub, up the disused stairway to the bridge, where we stood in high wind, exposed for miles in every direction. With Hollywood timing, a fine mist of rain began to fall. There wasn’t much talking. We performed a sort of slow trundle, moving along a narrow workman’s gangway through whose generous grating one could see very small cars hurtling along the autobahn. “Watch out for this one,” Jens called from up ahead, and poked his foot through a panel that was, to my gripping horror, coming loose from its rivets, one corner plunging into space. Léa dawdled behind us, occasionally stopping—insanely, I felt—to admire the view. The other side of the bridge was not much better. On the ground, we found ourselves trapped by walls of unclimbable black pipe, warm to the touch, which guided us along the railroad. 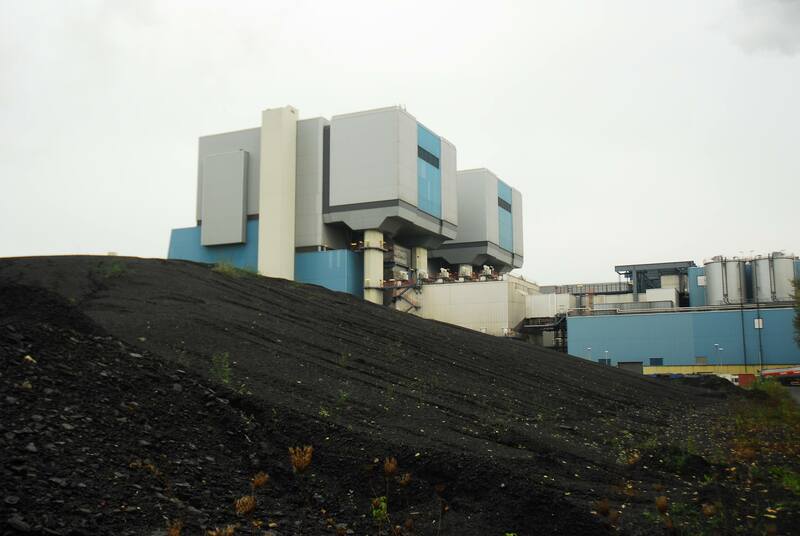 A garbage incineration plant loomed over our left shoulders. Pits of gravel fell off to the right. A second, shorter bridge took us over the river as coal barges passed silently underfoot. Workers threaded their way along the barges purposefully, hard hats bobbing with the current. No one looked up. On the far side of the second bridge, we ducked through a small doorway and into the heart of a tremendous, functioning coal power plant. It was the land of the giants. It was Metropolis. Jens snapped pictures of each mammoth structure we walked beneath, devices for moving or digesting coal, I assumed. Pulses of adrenaline made my knees ache. In an underpass beneath the railway, we surprised a workman coming from the other direction. Amazingly, he seemed poised to simply walk past us when, even more amazingly, Jens stopped him to ask the way out. A fast, friendly dialogue ensued. This process of interrogation was repeated as we made our way past humming machinery and through a damp tunnel illuminated by bare high-wattage bulbs. My legs resolidified only when we stood outside the secured perimeter, once a gatekeeper had delivered an amused dressing down. We walked through the employee lot, past Audis and Beemers, and beneath vertiginous coal chutes that crisscrossed the plant in every direction. Today, the would-be flâneur has more ground to cover, but she is also more confined to the homogenized destinations of the city center, where few surprises await. Elsewhere, she may be impeded by some of the physical barriers we had already encountered. For twenty-eight years, the Wall created extreme spatial and psychic divisions among the city’s population. Those are by no means healed today. In its physical absence, though, the zwischenstadt has taken hold, and with it a new psychological blockage. A new dead zone. Thomas Sieverts, the architect who coined the term zwischenstadt in a book of the same name, describes them as “the living space of the majority of mankind,” although his preferred translation is simply “where we live now.” Unplanned and unpresuming, the zwischenstadt lacks the wildness of nature, the mythology of the city, or the interpersonal connections of the village. It must be described by absences, Sieverts argues, because so far no one has contended with how such spaces are used. Until recently, we had not even theorized their existence. They remain unarticulated. Roth, Hessel, and Walser would have passed them by, not realizing there was anything to see. Walking these spaces was not just a hobby, Jens told me. It was a cultural obligation. “Peripheral spaces are just as real as a city’s middle,” he said, bread in hand, “even this shopping area.” He gestured to the dull buildings around us: a gym, a gardening center, a furniture chain called Schöne Sofa. “They have a history, a geography—people live here. We just don’t know where here is yet.” There was much work to be done, it seemed, even if neither Jens nor Léa could quite express what that work might look like beyond the fleeting work of the walk itself. “Maybe that’s why you’re so interested in the zwischenstadt,” I suggested. He shrugged. Deeper in the woods, we bade viel glück to the occasional mushroom hunter. For years after Chernobyl, Berliners would not collect mushrooms for fear of radiation, but now they seemed to have revived the tradition. On the far side of the Flughafensee, or Airport Lake, we found a system of locks, rusted and boggy. We could make out silver blades that were the backs of hundreds of small, suspended minnows in the black water. In keeping with the theme of nuclear contamination, we passed two men in what looked to be orange hazmat suits, walking weed whackers across an empty field. The illusion was broken when they lifted their facemasks and waved to us. Jens began talking about the urban history of nuclear fears: not just fallout shelters, he said, but whole cities planned around the destructive potential of the atomic bomb. I countered with the history of uranium mining in the American southwest, boomtowns in Utah and Arizona that had once supported thousands of workers and now housed a few toxic pit mines and gangs of roving tumbleweeds. Ghost towns and bomb-proof cities, the deferred promises and prophecies of the atomic age. Walking, Rebecca Solnit once wrote, is a subject that is always straying. At the edge of the woods, we came upon the high outer wall of a prison complex, punctuated by Benthamian observation turrets with darkened windows. They looked exactly like those I’d seen in photographs of the Berlin Wall. Tegel Penitentiary is the country’s largest prison, with more than 1,600 inmates. It is old enough to have featured in Döblin’s Berlin Alexanderplatz and big enough to warrant a complicated hierarchy of sub-prison communities, each with its own warden and staff. Around the front of the prison, we passed through a quiet garden and entered a small shop selling items made by the inmates: birdhouses, wooden dinosaurs, denim jackets. For their full-time work, the cashier told me, the prisoners earn 300 Euros a month and are entitled to eighteen days a year of paid holiday. It occurred to me that here, in this model reforming prison—with its special recreation areas, its post office, its team of therapists, even its shops and manufacturing jobs, all surrounded by lush, if inaccessible, greenery—here was Le Courbusier’s city-village in vivo. It was all just as he’d imagined, down to the lofty heights of the prison church. As humane and rehabilitative as the prison no doubt was, it struck me as the sort of paternalistic system that only succeeded because the inmates were, well, forced to stay. Otherwise, people do not want to have their needs provided by a benevolent reformer. They do not want the efficient urban ideal. The futility of such a notion was even touching, I felt, standing in the prison wall’s vast shadow. Urban life is no more conquerable than nature. Both follow a kind of pheromonal divination, moving in kinks and curls, responding to subterranean and subconscious pressures. Cities, too, want to walk, even if the places they’re walking are far away, hard to reach, or have not yet been named. What next? What else? Walking is not so much a grammatical activity as it is a perpetual state of conjunction, a ribbon without end, and so I can only list the disused bottling plant, windows all blown out or boarded up; the rows of beflowered, silent balconies; the rusty gate of an artists’ commune covered in gargoyles; the old Russian women pushing carts filled with secret junk; finally, Tegel Lake, hung with sailboats against an emerald field. We walked in silence along the edge of the water as our path became a seaside promenade. Cormorants preened on dancing buoys. At a self-service café, we ordered a round of Radtlers and watched dirty gray swans snap at children in the descending twilight. Léa lit two cigarettes and passed one wordlessly to Jens. There wasn’t much to say. We were tired. Léa had been visibly favoring her injured ankle over the final kilometers. In two days, they’d fly back to Paris, where they would conduct more tours in the distant arrondissements. The Berlin walk was finished. This café was precisely where they’d started their journey nine days ago, in a serene neighborhood of former West Berlin chosen at random. In the satellite view they later showed me, their finished path made a jagged medallion around Mitte, with jigsaw cuts slicing apart the camo pattern of city, town, and forest. It looked nothing like a circle, but it was a magnificent line.